Comments: Evergreen broadleaf native to Victoria, South Australia and New South Wales, Australia. 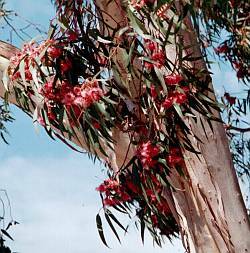 Smooth barked eucalyptus with lanceolate leaves and showy red flowers in groups of three. Flower color is not a prime identifier for this plant. Tentatively identified as Eucalyptus leucoxylon subsp. 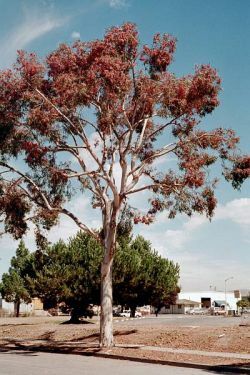 megalocarpa. The specimen tree was removed.